How many pieces of pi are too many? Re: How many pieces of pi are too many? Looks like you're mostly using Pi0s and Pi0Ws. I think I could match your count of those boards and that's before dealing with the various B-series models, of which I have considerably more. And seriously doubt that I have the largest "collection". The good news is that our first 2,000 boards arrived in the UK on Monday and that we are working to get them CE marked as soon as is humanly possible, in parallel with bringing the remainder of our initial batch into the country. I tend to reuse mine. I just change out the mSDHC card, the pendrive, or the HDD/SSD. But mine are used as desktop computers - (I only have 4 => 2x 3B, a 3B+, & a 3A+). of which 6 are in projects, either current or past and 3 of those are on 24/7. 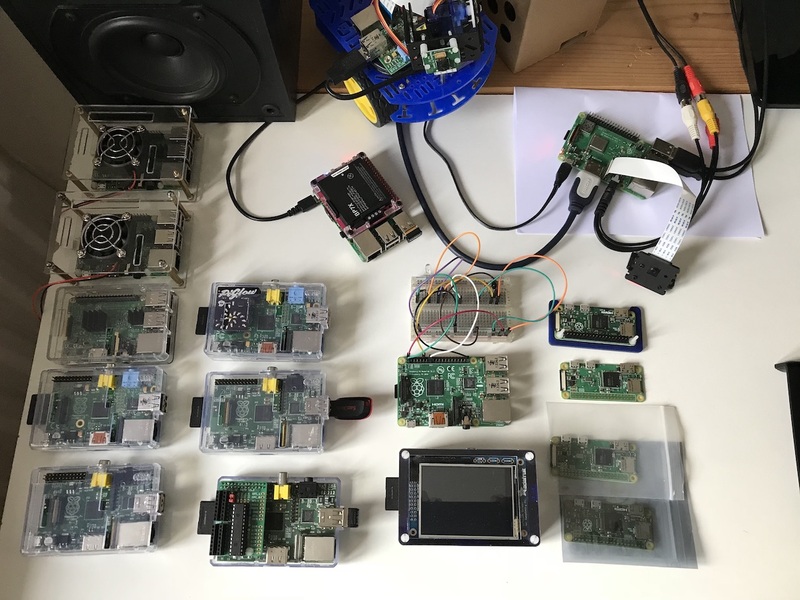 Some of my Pi's, have subsequently got more PiZeroW's, another Pi3B+ and a Pi3A+ ! Two 3B+'s, two, 3B's, a 3A+, two A's, and a dozen or so, I've lost count, Zero W's. I've passed on a couple 2B's and B+'s to new homes. But, beyond the appendage waving contest, it doesn't really matter how many one has or how few. I can't say mine are all constantly in use. One is permanently on so I have instant access to try things out. The rest come out as needed when I set off on some adventure. I'm hoping I find an "A" of some kind to try that with gadget mode. Are you using them all? How many power ports do you have in your house? Im having trouble powering just 4 of my Pi due to the face each room (except the bathroom and kitchen) only have 1 power socket. I have about 22 Pi altogether. 11 of them are one 24/7 doing all sorts of things. How many power ports do you have in your house? I know you weren't aiming this question at me, but the answer is lots. I made sure of that, but I still do use a few muti-socket extension cables. 7 temperature senders, 2 security cameras, telescope, ADSB receiver, MLAT receiver, 2 probe request monitors (static& mobile), LAMP server, DNS server, 3d print server, HUD Speedo, dashcam, fileserver, desktop pc, 3 commercial video monitors for a customer, aquarium, testbed, 1 dead zero, 3 spare testbeds. - 1 Pi3B running octoprint 3D printing server, mounted directly to the 3D printer with a HDMI touch screen. In the not too distant future I'll probably be getting a few more Pi0w as surveillance cameras for my newly refurbished barn. But if each power socket only allows 13 Amps to be drawn, using a 12 way socket means that a maximum of 1A can be drawn from each socket. Currently, with my setup here I use a 3-way socket, 1 socket has a 3 socket extender effectively giving me 5 sockets in total. I use 1 to power 85W charger for laptop, 2 to power Raspberry Pi, 1 to power mobile phone charger, and 1 to power a monitor. A word of advice: never plug a vacuum cleaner in one of these extenders, it can be bad for your health and your raspberries. Once upon a time, quite a few years ago, I had a Compaq UPS to protect the devices on my desk(*) and accidentally plugging in a vacuum cleaner caused the UPS to go into overload. These household devices can cause quite a spike when switched on. (*) On my "desk" at that time I once counted two 8-port hubs/switches, a Cisco enterprise router, two CRT monitors, a Cybex dual matrix 8 port KVM switch with extender and 13 PCs. Nothing has changed much, I still have to many systems around me. "Bad for your health" as in money wise?? That is why I opted to go for a 3 port extender. Each power port supplies around 4 amps. 1 socket can power a vacuum so no issues there. There are only issues if you decide to increase past 6 ports or so. New CM3+ must be acquired? Is there an intervention society for Pi addiction? As far as I can tell there are plenty to encourage this addiction. Been thinking of rewiring the lighting circuit for solar/battery backed 12V LEDS. Should be good for Pi powering too? We need more Pi's, when the Tech crash comes all we will have is pedal powered Pi's. We need more to keep the Internet alive for email by a Pi LoRa network. We need more Pi's, "More please Sir" Pi's will save the World. We need millions more to store in Pi seed banks. We need more PI, new ones with lots of storage that does not wear out with the plans to reboot the World. A Canticle for Leibowitz, we will be the Monks of Pi? I only have one pi. And add 265 to the end.